In 2017 you can film, edit and watch whatever takes your cinematic fancy within minutes thanks to the advances in mobile phone technology. And that's at an incredibly amateur level, if you want to film something with higher production values you can achieve this for several hundred pounds thanks to digital technology. Back in the 1980s, though, even if you wanted to film an out of focus wedding reception (not always a bad thing considering the haircuts) it was a much more testing and time consuming task. Thankfully, ready to lend a hand, was Video Active. Jonathan Hughes (Nigel Planer) and his wife Libby (Susie Blake) host the daytime magazine show Wake Up! from the comfort of their garishly 90s armchairs against the backdrop of an equally charmless 90s show home. Producer Jeff Shreeve (Stephen Moore) would love Wake Up! to showcase the chemistry of Jonathan and Libby, but they've been running on empty for some time now. Accordingly, the duo's life is characterised by a creeping sense of misery, compounded by the Jonathan and Libby brand they feel beholden to. Maybe it's time for them to Wake Up! Going Live! Tiswas! SM:TV! Saturday Superstore! These are the shows that are regularly referenced as Saturday morning highpoints for children's TV (some may also mention Zokko! but, technically, that went out in the afternoon) but over the last 50 years there have been many more such shows. As you've probably guessed, I can remember plenty of these less iconic shows but, nonetheless, they still provided a little bit of excitement to otherwise mundane Saturday mornings. 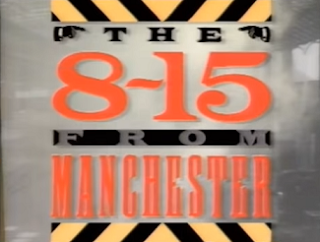 One that I remember catching, in particular, was The 8.15 from Manchester.